Celebrities stepped out at the dunhill Pre-BAFTA dinner on Wednesday (February 6) in London, England, alongside Ellie Bamber. 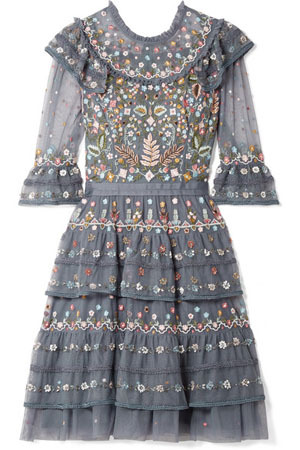 Rosie Day: The ‘Outlander’ actress looked sweet in a Needle & Thread dress which highlighted the brand’s signature embroidery. The shorter length and metallic shoes enhanced the charm. Nell Hudson: Rosie’s costar shone in a creamy slip dress which had a magnificent liquid drape. Some might wish for a touch more finesse in the styling but the carefree spirit works for her. Wallis Day: Switching gears, the ‘Krypton’ actress went for structure in Petar Petrov Resort 2019. The retro touches and bold pumpkin orange bring out the jovial spirit in the timeless tailoring.